A Case study compiled by Ross Milne Management Tutor , The Auckland University of Technology . Living and working on the Asia-Pacific rim means having access to many new and exciting ideas from the cultures that have lived in this region for many thousands of years. New Zealand is part of the South Pacific. Before the Europeans came to New Zealand, the indigenous peoples-Maori-lived and traded as iwi-the groups descended from each of the great canoes that carried the people to these islands. This case study is about sharing a model of leadership that has come from one of these communities of descendants. It is an action-focused model that can be used by any organisation, project, group, team, family or even individual that needs to make new things happen. Tipu Ake's genesis was brought about by the threatened closure in 1996 of a small rural school in an isolated area of the Whirinaki State Forest. The board of Te Whaiti school and the local community (unemployed for a generation since native timber milling was discontinued) set about a process of transformation that began with self-reflection. They used the imagery of their magnificent podocarp forest to help explain the organic, cyclical nature of their unique process. Five years later the school's environment has changed dramatically, attracting excellent reports from the Education Review Office. The school's turnaround drew the attention of Peter Goldsbury, one of the school's past pupils and an experienced project manager. Peter, who delivers short courses in 'Managing Projects and Innovation in your Organisation' at Auckland University of Technology (AUT), recognised that the transformation process that the school had devised to heal itself seemed to overcome the limitations of the conventional, linear style of management thinking. Over a period of several months Peter, the school board, the kaumatua or elders of the community, AUT staff and participants in project management workshops adapted this process into a model for managing innovation in business. The model was named Tipu Ake ki te Ora (growing from within ever upwards towards wellbeing). I returned to Te Whaiti on a research assignment to try to help them capture their unique natural processes to share as a new organisational leadership model and was amazed by the wisdom and positiveness shared by elders, the community and the school. I began to understand why the concept of compound interest did not fit easily with them-their maths was different. I saw the significance of a popular quiz question during my time at Te Whaiti School. In the Tipu Ake lifecycle, however, there may be a model of universal applicability. At a meeting in August 2001, Peter spoke of his involvement in developing the model, saying that he felt 'immensely privileged to be chosen to help put [it] together, a task almost a lifetime in learning'. He presented his own understanding of Tipu Ake ki te Ora, how its strength came from them rediscovering their wairua [internal spirit]; that it is through collective wisdom that society achieves global wellbeing. These people force us to think right outside the square. They have visions of wellness, concepts of shared leadership, teamwork, collective sensing and wisdom that demonstrate that the whole is much greater than the sum of its parts. Far from just 'catching the knowledge wave' they offer those who would listen the opportunity for Aotearoa [New Zealand] to 'grow it'-to take a unique leading place in the world. The life of Peter Blake and Team New Zealand's success repeats the same challenge. But Peter has found that the path to collective wisdom is not a straightforward one. It has been a rewarding passion, but not an easy journey for me as a pakeha [New Zealander of European descent] to translate but a little of their holistic and organic thinking into a model understandable by organisations in a linear world preoccupied with facts, with individuals and dollars. What is Tipu Ake? The following diagram is a business model perspective of the Tipu Ake lifecycle. It is a behavioural model that reflects the complexity and interrelatedness of the world. The differences between the Tipu Ake lifecycle and other business models are considerable. Most contemporary business models take a linear path towards the achievement of objectives. Tipu Ake is cyclical and acknowledges the significance of returning to the 'undercurrents', the negative resistance that can be channelled into a re-germination process that ultimately strengthens the organisation. The model consists of seven layers. Growing out of the 'undercurrent' requires shared leadership to nurture the 'seed'. The seed takes root through the commitment of the team to support its growth. Action requires organisational processes to strengthen its growth. Beyond these processes, sensing builds the individual perception into a collective view; that is, the foundation for collective wisdom of the group, achieved through teamwork and the sharing of leadership. 'Pest control' (alias risk management) is the process used to react to the destructive effect of 'pests' that frustrate upward growth. More importantly, the 'birds' represent the proactive processes that germinate new ideas and capitalise on opportunities. In the knowledge-sharing tradition of Toi, the Tipu Ake lifecycle is in the public domain gifted to the world's children © 2001 Te Whaiti Nui-a-Toi. In return a koha (gift you can afford based on its value to you) is appreciated, to help further voluntary education and community development for the wellbeing of children in the valley and beyond. 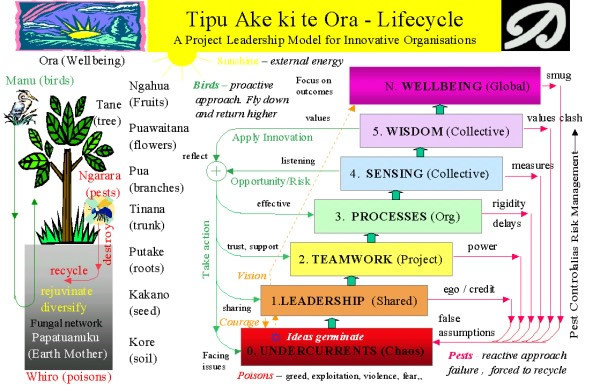 This is an invitation to learn about the Tipu Ake lifecycle and then use it to contribute to global wellbeing-and to thank Te Whaiti Nui-a-Toi for sharing it. 1 The case study is as much about a personal journey to understanding as it is about Tipu Ake. Yet the journey is Tipu Ake. Discuss this statement and in the process relate it to your own experience of learning. 2 Consider Tipu Ake in relation to Geert Hofstede's research on organisations and culture. Is yours a culture that is likely to embrace Tipu Ake? 3 The full name is Tipu Ake ki te Ora 'growing from within ever upwards towards wellbeing'. As described in the case 'it is gifted to the world, dedicated to the wellbeing of all its future children'. Explore other Pacific Rim cultures and see if you can find any other examples of a process that you can compare to Tipu Ake. 4 All Tipu Ake intellectual property and copyright is assigned to the place of its origin, Te Whaiti Nui-a-Toi from where it can never be sold or stolen. Discuss the ownership of indigenous wisdom passed down orally for thousands of years and the implications for those who may now write it down, publish it or try to exploit it.